S one. 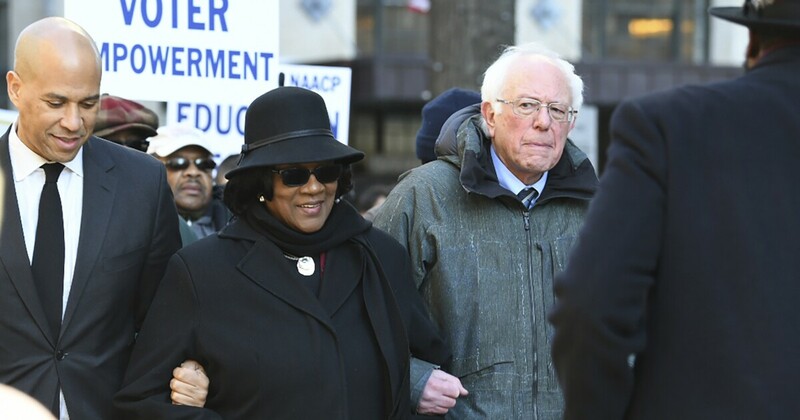 Bernie Sanders ripped President Trump as a racist Monday during a blunt Martin Luther King Jr. Day address at a NAACP rally in South Carolina. 9 King Day at the Dome, held at the South Carolina State House in Columbia, during his remarks, he recalled being in Washington for King's 1963 "I Have A Dream" speech. the right to vote. "Racism is alive when the United States Supreme Court and Republican governors make it harder for people of color to vote and when they are suppressing the vote," he said. being racist, but his Monday appearances at a prayer service, march, and rally in the early nominating state was closely watched by political pundits as the 2016 Democratic presidential contender continues to weigh whether he'll launch another bid for the White House. ] Sanders' remarks come in the wake of a comment to the Daily Beast in November that "white folks" may have felt too "uncomfortable" to vote for black candidates in the 2018 elections. Sen. Cory Booker, D-N.J., Another 2020 prospect, also attended to the events in the Palmetto State. "I've come to learn in this country that we have a common pain, but we seem to have lost a sense of common purpose," Booker said, echoing in Instagram post he shared at the weekend. "We need each other. We must awake a more courageous empathy." The pair's foray to South Carolina coincided with one of their Senate colleagues officially entering the 2020 race. Late. Kamala Harris, D-Calif., Announced her candidacy Monday during an interview with ABC's "Good Morning America." More than two dozen Democrats are expected to seek their party's need to become the president.